By using Triple7 Envirobore, the irrigation firm has effectively cleaned the filters whilst protecting the health and comfort of their workforce. The irrigation firm’s filter medium was cleaned and brought back to near new condition with little or no downtime and minimum product usage. The Triple7 Envirobore has improved sustainability along with improving filtration results without the need of media replacement. 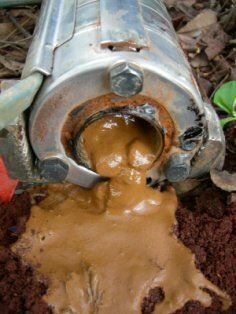 A large irrigation firm had a ferric iron deposit build-up in their Amiad 3″/30″ media filter. The iron bacteria builds up in layers, each forming a slime around the bacteria cells that keeps disinfectants from penetrating beyond the surface cells. An ordinary backwash mode does very little to dislodge the bacteria congestant which causes a major reduction in filter flows. How do you efficiently remove iron bacteria build-up in filters without disassembling and downtime? Iron Bacteria has traditionally been removed by chlorine and/or acids that are both hazardous and toxic to both workers and the environment. Additionally the removal of contaminated media for either external washing or replacement creates potential strain hazards with media handling. Adding five litres of Triple7 Envirobore (1:600) resulted in a murky brown, soup-like discharge along with the removal of the iron bacteria. The medium was cleaned and brought back to near new condition. Triple7 Envirobore’s cleaning formulation is built on three plant-based surfactants that create unique hydrocarbon release agents able to tolerate tremendous soil loads. The powerful micelle cleaning action causes long chain hydrocarbon soils to be repelled from the cleaning surface so that soils can be rinsed away with water.